An Exciting Discovery! 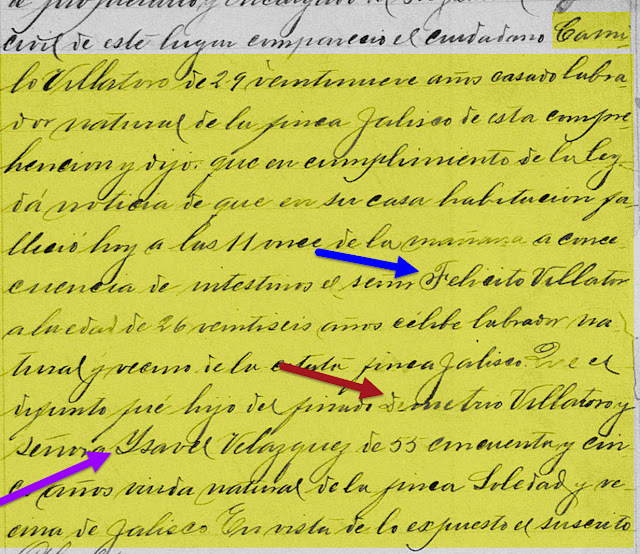 Could This Felicito Villatoro Be My 2nd Great-Granduncle? While doing research on my Mexican ancestral lines, I found a very interesting death registration record. Or perhaps I should say I found it again, because I had saved it to My Shoebox in Ancestry.com some time ago. I was doing research in FamilySearch.org when I found this record again. What record did I find? A death registration record for Felicito Villatoro. My maternal 3rd great-grandparents were Demetrio Villatoro and Isabel Vasques. I don't know much about them. What I do know so far is that Demetrio passed away sometime before 1902 and Isabel passed away sometime between 1902 and 1925. Here's a close-up of two highlighted portions in the record. Since I don't speak Spanish, I turned to Google Translate for help. The translation isn't perfect, but it provides me with some important clues. 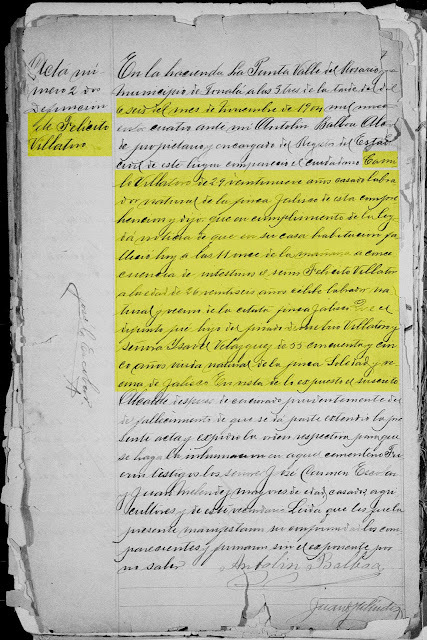 "Camilo Villatoro of 29 twenty-nine years old married natural farmer of the Jalisco farm of this understanding and saw that in compliance with the law news that in his house he died today at eleven o'clock in the morning with the intestines, Mr. Felicito Villatoro at the age of 26 twenty-six years ? natural laborer and neighbor of estates Jalisco estate. That he was the second son of the late Demetrio Villatoro and Mrs. Ysabel Velasquez, 55, fifty-five years old, a natural widow of the Soldedad and Vicina farm in Jalisco." 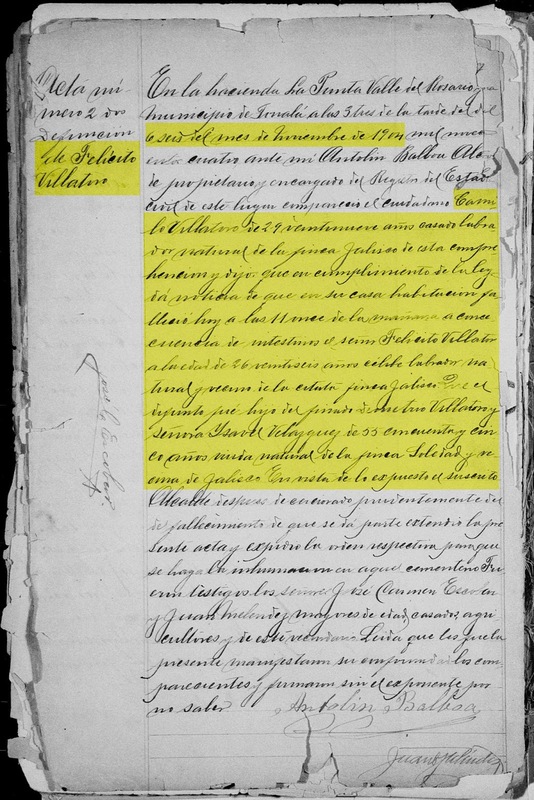 So, could this Felicito be a previously unknown son of my 3rd great-grandparents, Demetrio Villatoro and Isabel Vasques? Some interesting clues jump out at me. Camilo, who appears to be the informant, is one of the sons of Demetrio and Isabel. It would make sense for him to be the informant for his brother. Camilo's age doesn't match what I have though. In this record it says he's 29, which puts his birth year at 1875. The birth year I have for him was calculated from his death record. Perhaps the informant for his death wasn't correct. In this record Felicito's parents are listed as Demetrio Villatoro and Ysabel Velasquez. Vasques and Velasquez are kind of similar. There are three different variations of Isabel's last name in three of her children's death records. In Raymunda's death record, Isabel's last name is listed as Vasquez. In Felicita's record, Isabel's last name is listed as Basques. And in Zenon's death record, Isabel's last name is listed as Vazquez. So is Felicito's record just another variation? Also, the record states that Felicito Villatoro was the second son of Demetrio Villatoro and Ysabel Velasquez. The fact that he was the "second son" fits with my Demetrio and Isabel Villatoro family. Camilo was the first son. And Zenon was the last son and was born in 1879. Felicito could have been the second son since his calculated birth date is 1878. I definitely need to do more research to verify if this Felicito Villatoro is the second son of my 3rd great-grandparents, Demetrio Villatoro and Isabel Vasques. But, this death registration record is a very exciting find.